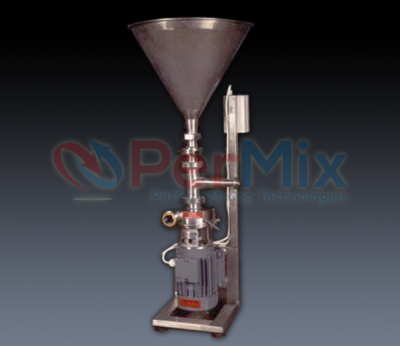 PerMix PT-C Series Powder Liquid Mixers are designed for fast and high volume powder mixing into liquid. They are especially distinguished when the powder is "difficult-to-wet" with conventional blending method. 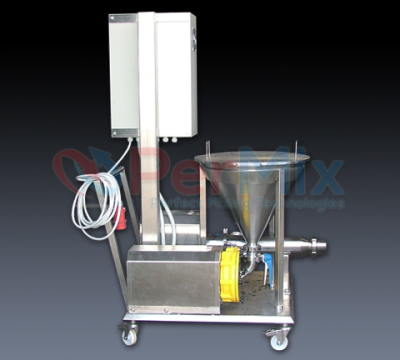 With all its unique features, our PT-C Powder Liquid Mixers are widely used in mixing of all kinds of powder products by a variety of industries, e.g. food and beverage, dairy care, pharmaceutical, chemical. 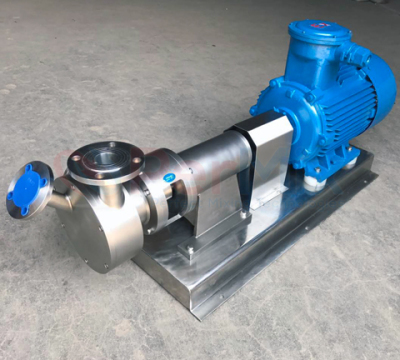 Our unique PT-C series Powder Liquid Mixers are integrated by two parts, a casing pipe and a stator rotor high shear mixer. The casing pipe is built vertically and coaxially into the stator rotor system inlet. This double-wall design prevents the powder going through the casing pipe contacting the liquid and forming lumps before they both arrive at the stator rotor system. As the rotor running at high speed during operation, liquid enters into the chamber and a water ring is created. 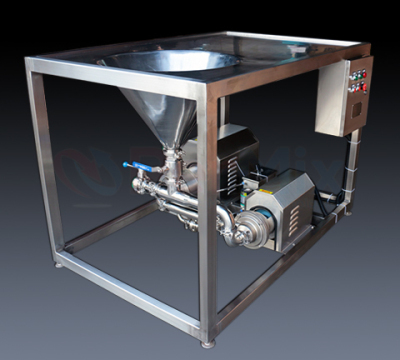 Vacuum is generated at the center which causes suction of the powder from the hopper above the chamber. A valve at the bottom of the hopper is used to regulate the falling rate of the powder. As soon as the powder gets in contact with the liquid, it is wetted and dispersed into the liquid by the turbulence and later high shear force when the mixture goes through the precise machined clearance between the stator and rotor, and radiated out through the stator openings. 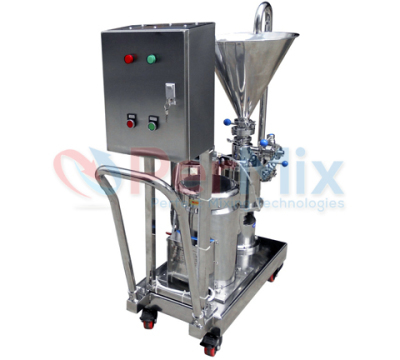 Except the double-wall design of PT-C series Powder Liquid Mixer, there are many other ways for powder incorporation into the liquid. The selection among them depends on the processing requirement, material character, budget, etc. With our more than 60 years of know-how, PerMix has the experience to work out the best solution with our customers. Preparation of syrup, sorbitol, glucose, lactose, etc. Reconstitution of powdered milk, whey, protein, etc. Gasket sealing of FPM, FFPM, etc. Hopper of 50°, 60°, etc.